John Bourne & Company – FORS Gold ! 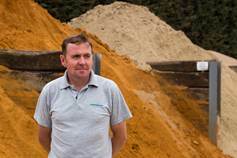 John Bourne & Company is a business originally rooted in agriculture it has adapted and developed over the past 70years into one of the country’s leading suppliers and specialists in the provision of hard and soft landscaping materials. We are a third-generation family run business with focus and dedication to detail that has seen us thrive in the area of specialist soils and growing media. Through the development of our blending, screening and bagging facilities around the South East, we have been able to develop our range of products and offer bespoke materials to the ever more technically demanding sector. One of the keys to the dedication of the landscaping industry is the continual investment in our haulage fleet. The increasing prominence of deliveries into tight urban spaces coupled with consistently challenging projects and give peace of mind to customers working on confined and highly regulated sites. At the heart of business’s evolution has been the emphasis on working with nature rather than against it. Our philosophy of offering the best in terms of quality and service always remains the same. We initially became aware of FORS through trade media and trade associations over 5 years ago now. It was recognised that the FORS standard would be of benefit to the company to help improve compliance, driver training and would also give us a competitive advantage. We had our first Bronze audit in 2013 and from this we were able to identify areas in need of improvement such as our processes and documentation of records, minor improvements, but we took all on board to help streamline, improve and build on the processes we already had in place. We were encouraged by the guidance of the FORS standard. In our continuation of being FORS Gold members we have been committed to reducing our emissions, bettering our driver training programme and understanding how our business impacts on the environment. We are committed to introducing new trucks every year to help maintain our fleet within the expected Euro 6 category to enable use to continue to reduce our fuel emissions. We use the FORS safety standard to make sure all our vehicles meet the safety specification, including in cab sensors, left hand audible warning alarms, 360-degree cameras and side under run bars. 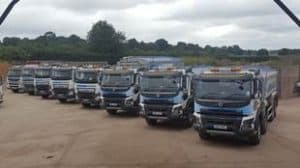 We have made enquiries to purchase a further 2 vehicles in 2019 replacing 2 older vehicles which no longer meet the emissions specification, enabling us to continue to deliver more tonnes per gallon of fuel. Again, this year we have continued the trend in the reduction of fuel usage, (395,046 litres in 2017 to 310,286 in 2018) and increased our mileage with less fuel usage (940,149 kilometres in 2017 to 1,076,689 kilometres in 2018). We continue to use the FORS e-learning portal and FORS workshops as a basis for all our improvements, these learning platforms are a major benefit of being a FORS Gold Member. The FORS scheme supports our vision as a business which allows continuous growth and development, not only as individuals but as a whole as well. Maintaining those high standards is key and FORS supports us in doing so, this can be in the form of the online courses they offer to prompt feedback on emails. FORS e-learning has introduced a new level of training to our drivers, it enables them to access the e-learning portal in their own time. It gives them control of they’re learning and an understanding of what benefits FORS has for them as well as the business. Having the drivers be in control of their learning has seen an improvement in the completion of online courses and therefore the driver’s knowledge and understanding, in relevant areas such as security and counter terrorism, especially as a lot of our work is in London, thus making them more vigilant. Our driver’s expertise and knowledge are key to improving our performance. Maintaining FORS Gold for us is a major achievement, we see the daily benefits with regards to workload because sites note that the FORS Gold accreditation shows that we have vehicles which are at the top of their safety specification and that we are dedicated to the improvement of our safety record. It assures our customers that we are working using best practices and will continue to do so to maintain this accreditation. Safety is our main focus and promoting the FORS standard has enabled us to develop and share best practice through collaborations with other fleet operators. Due to the FORS standard this has helped us to implement and monitor several different KPI’s, one such being our continued reduction in fuel used and emissions. With the upcoming changes to ULEZ and LEZ in London we acknowledge that we will continue to reduce our fuel usage and therefor lower our emissions impact on the environment. We have begun to investigate the purchase of our next vehicles to add to the fleet and we have taken into account alternative fuel vehicles, this has been discussed but as yet due to the nature of our work and sites which we deliver to, currently we do not see a suitable alternative would be of benefit to us. We will however be purchasing euro 6 vehicles which will maintain our commitment to reducing emissions. We continue to be committed to promoting the FORS standard and maintain our FORS Gold accreditation. To help improve this our Haulage Administrator, Liz Kimber has become our Transport Supervisor. This role will show a commitment to the FORS compliance standard and we have enrolled her onto a FORS practitioner course in 2019 to continue in our development and progression. We have also recruited another administrator to help with this transition. We will be working with a local recruitment agency to encourage drivers into the industry and will be approaching the apprenticeship scheme, with hope to see a new wave of younger drivers being brought into the industry. Maintaining the Gold accreditation is a great accomplishment and one which we are very proud to have, it shows our commitment to reducing road risks and to maintaining both driver and vulnerable road user safety. Having the FORS logo on our fleet of trucks shows our clients that we are committed to improving our impact on the environment and that all our trucks meet specific safety requirements. Using the FORS standard has improved our compliance record keeping and monitoring and enables us to see year on year improvements.